If you like Denmark, or even if you don’t, Den-mark my words you might like this. With an opening gambit such as that you’d be disappointed if we took you anywhere but the aforementioned pastry peninsula. And who are we to lead you down the Lego brick road under false pretences. For the avoidance of doubt AutoPot visited Denmark this September to garner a greater understanding of the evolving growing scene there. As Denmark is reputedly the the happiest country in the world we thought we’d balance things out a bit with our touring party. Thus we had Jason Ralph-Smith (Managing Director) and Dave Gulliver (European Accounts Manager) Lurpaking their bags and spreading their wings (liberally with butter?) for Copenhagen. 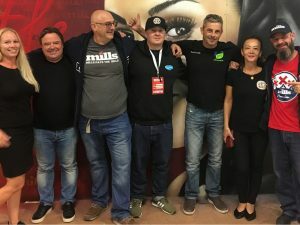 Our team were bound for the inaugural North Grow Expo – a three day international event showcasing the medical and commercial potential of MMJ to Scandinavian governments and their public alike. 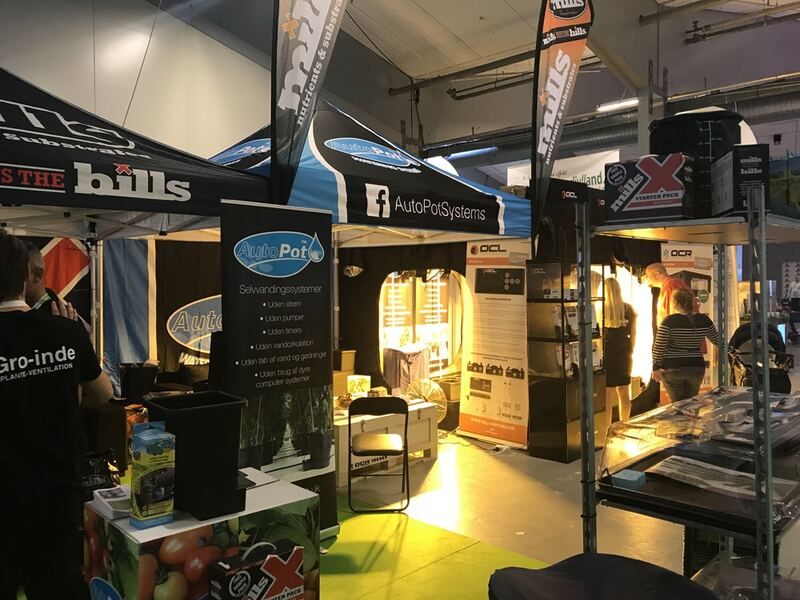 In the sublime company of Danish AutoPot Distributors Gro Inde, Mills Nutrients and OCL Lighting we assembled a marvellous little enclosure in the Bella Centre, a stand that beautifully combined our mutually respected wares. 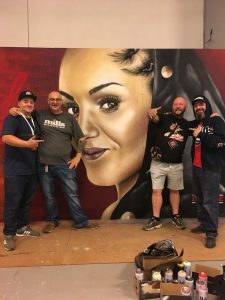 It’d be utterly remiss of us not to tip a nod to James, Pawski, Robbie, Cristina and Pauline for their hard work, artistry and the good times we shared. Good times aside we learnt a great deal about the current expansion in Danish cultivation and the forces driving it. We’ve just got to tell somebody about it, so here goes! Denmark’s legal MMJ program is very much in it’s infancy. A four year medicinal cannabis pilot programme came into existence on January 1st 2018. Despite the usual brouhaha and headlines this program merely allows doctors to prescribe medicines derived from cannabis that were not previously legal. The aim here is to lawfully assess the potential use, value and cost of such medicines in comparison with existing pharmaceutical products. So this is far from a free-for-all. Reports also suggest that Danish doctors are taking a very practised, professional and cautious approach to prescription despite the popular appeal of cannabinoid medicines. However, for genuine proponents of such medicines, in-depth study, proper trials and scientific endorsement can only be a good thing in legitimising use. The products available in this pilot programme are entirely dependent on the will of outside manufacturers. Their imports will dictate the medicines used. In future, rather than remain at the whim of outside producers, Denmark, like many other European states, is seeking to establish indigenous commercial cannabis cultivation. 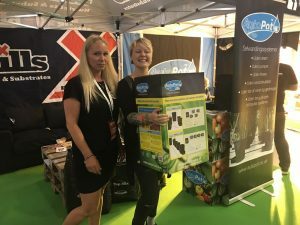 All this means that vanguard Expo’s like North Grow have a key role in showcasing cultivation technology to a Scandinavian audience. Getting out there in the first wave means getting to talk to some enormously ambitious growers and advise and inspire them with our spellbinding tech. We enjoyed some very enlightening chats with people contemplating involvement in various forms of cultivation and other visitors who were outright shopping for systems to fill their licence-holding commercial facilities. Facilities are being developed apace in Denmark despite the ongoing nature of medical trials. 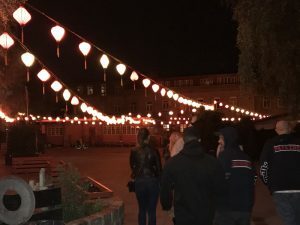 The experience of other European nations such as Germany in the problems of supply and demand have perhaps informed the Danish government’s decision to grant cannabis cultivation permits sooner rather than later. This should mean that if, as expected, the trials prove fruitful the infrastructure will exist to provide medicines at scale and without exorbitant cost. Whatever the outcome of medical trials there are economic considerations at play including the potential export market to those European countries that do evolve legal MMJ programs. 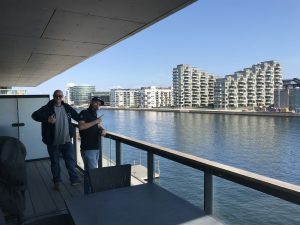 And whilst many Danish licence holding companies do partner with larger multinationals it is intended that the Danish connections will have growing facilities in Denmark to best serve demand there. As is usual with emerging markets there are grand designs aplenty. The positive for Denmark is that existing domestic commercial horticultural companies are prepared. Indeed some have already begun to repurpose their facilities for cannabis cultivation. Partnerships such as that between tomato grower Alfred Pedersen & Son and Aurora Cannabis have already seen an existing 100,000 square ft facility transformed and cultivars imported in order to populate it. This is Phase 1, with estimated output of 8000kg per year. Phase 2 involves a 1 million square ft greenhouse producing 120,000kg per annum. Such production may seem extreme but it is hoped that if companies can later gain export licences they can ultimately reduce the cost of treatments, making the medicines an even more viable proposition. 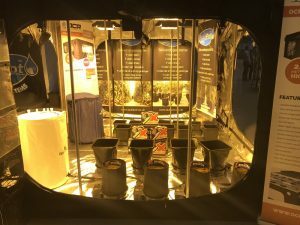 With reducing costs a major factor in the future of Danish cultivation it came as no surprise that there was a great swell of interest in the AutoPot technology on show at North Grow. As long as growers who care about minimising overheads and increasing efficiency in automated cultivation continue to draw breath there will be AutoPot Watering Systems! That’s just standard. Opportunities are springing up in abundance and we very much hope to be reporting on some fruitful visits and ventures in the near future.